So, a new set released and I haven’t addressed it at all. It’s not that I didn’t want to, or lack things to discuss. I was just a bit busy with a far more important project. And then with watching a Pro Tour. And then with chaos. I realize that talking about Rivals of Ixalan is not exactly timely, but I’ve been sitting on this article for awhile now, and frankly I need more time to actually test Jace and Bloodbraid before I discuss them further. By now, everything that could have been speculated about the various Modern playables has been dissected to death. I’ve got nothing to add to the speculation, but I do have reps. Several cards interested me when Rivals was spoiled, but have mostly disappointed. No real surprise there; Ixalan is a tribal block and feels very depowered compared to Kaladesh, Shadows block, or Oath of the Gatewatch. However, there are a few gems worth discussing. 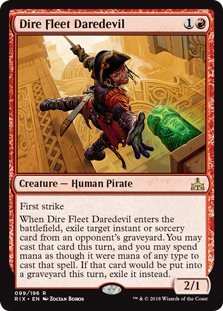 One “new” card I want to address before we dive in is Dire Fleet Daredevil. When the card was spoiled, there was a talk of a reverse Snapcaster Mage, but it has completely died. I also found it lacking. Daredevil has the “punisher” problem of being dependent on your opponent’s choices to be good—specifically, they have to play spells that you want to steal. That means something bad happened to you first. However, it started popping up in Humans decks as sideboard against Jeskai. This surprised me, since it just seemed like a counter to Snapcaster Mage, which is marginal even with Aether Vial. I’ve played against this strategy a few times now and have never seen it work out. Spell Quellering the spell back is very big game. If it wasn’t obvious that I would start here, you’ve clearly never read my archive. Merfolk was my deck for years, but over the past year I’ve played it less. The midrange green creature decks that I used to dominate have completely disappeared, in the wake of fast, disruptive decks. Merfolk can go big and it can go wide, but it does so more slowly than other options like Humans. The metagame has just felt more unfriendly. Ixalan attempted to reverse this trend. Instead of the traditional mono-blue or my favorite UW version, you could now play green. Kumena’s Speaker and Merfolk Branchwalker proposed to overturn everything we thought we knew about Modern Merfolk. Their improved stats looked good enough to justify changing colors. The problem: Speaker was a fine card, but Branchwalker was frustrating. It was so close to Silvergill Adept, but not close enough and it never seemed to be what you needed. Then Rivals came along and gave us a new lord, Merfolk Mistbinder. This actually has changed the decision calculus and I’ve been running UG Merfolk for the past month. Given that Lantern Control won the Pro Tour, I cannot fathom playing a creature deck without some way to remove an Ensnaring Bridge, so I’ll never be without Echoing Truth. I don’t miss the Branchwalkers, and the deck feels far better than the previous version of UG Merfolk. However, I’m still not sold on the deck. I’m not certain that UG Merfolk is actually better than mono-blue or my favorite UW deck. On the one hand, this is a far better aggro deck than either alternative. The green creatures allow you to curve out or kill on turn four more often. Having another pushed one-drop is enormous, and Speaker’s actually worth a removal spell (unlike Cursecatcher). This may not sound like much, but getting opponents to kill something that isn’t a lord is very good for Merfolk. Mistbinder isn’t great compared to Master of the Pearl Trident, but a lord is a lord, and lords form the backbone of the deck. The more lords you have, the faster you kill. But is it a better Modern deck? I’m not sure. The aggro boost comes at a cost which may not be worthwhile. 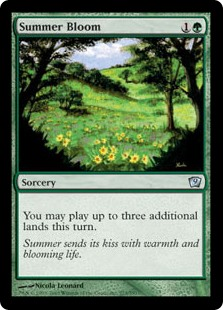 The problem comes from the sacrifices necessary to play green: my deck, and many others, struggle with the color requirements. In other versions, you only really need blue mana. UW can survive without white because we only use it for sideboard cards and Path to Exile. UG consistently needs green, meaning accepting a vulnerability to Blood Moon. This normally isn’t a problem, as mana denial is weak against aggressive decks (especially ones with Aether Vial). However, you can never fully rely on Vial, and the more non-basics you play, the higher the risk that hate will be effective and worthwhile. I have been locked out by Moon with UG, but never on UW. Opting for fetchlands to mitigate this problem just makes us vulnerable to Burn. Also, relying on Cavern of Souls as a fixer complicates casting non-creature spells. The other big problem is the sideboard. Green doesn’t provide many good sideboard options other than Natural State, and targeted removal isn’t very exciting. Merfolk doesn’t care about hard removal so much as tempo, so Echoing Truth is as good. Meanwhile, white has gamebreakers like Stony Silence. My experience so far says that UG Merfolk is better in race situations and worse in all other matchups. If what you want is pure aggression, then by all means. However, if you’re expecting longer matches where the sideboard matters, then UW is advantaged. Meanwhile, if you worry about casting your spells on time, then you’ll never go wrong with mono-blue. The other big acquisition is Blood Sun. The online chatter seems to have died down, but when it was spoiled, there were discussion threads all over the place about the card, mostly focused on its use in Tron—Blood Sun does not affect Tron lands. However, it can do far more with a little effort. Sun was made to shut down utility lands, so mana production is unaffected. Even if, like the Tron lands, your lands produce mana in a weird way, it doesn’t matter so long as they are producing mana. Sun also cantrips, so even when it’s a poor card, it isn’t too dead. While many have focused on attacking fetchlands or Ghost Quarter, Sun’s real advantage is against Valakut, the Molten Pinnacle. Right now, Tron has an even-at-best matchup against Valakut. Tron has a lot of land destruction, but Valakut can power through thanks to all the ramp and race Tron’s bombs. Sun shuts down the combo, forcing Valakut to either answer Sun or win with Primeval Titan (a losing plan against Eldrazi). Whether this is enough to justify sideboard space is uncertain, but it is a strong option. enormous downside compared to Black Lotus, but it’s just as broken alongside Infernal Tutor. Blood Sun is a “fixed” Blood Moon. Not as clearly oppressive as Moon, but potentially more powerful. How can we break this card in the grand tradition of “fixed” cards? The key is the line, “lands lose all abilities”—be they activated or triggered. That includes drawbacks like enters-the-battlefield-tapped or additional costs while in play. Urborg, Tomb of Yawgmoth is unaffected because of layers. Similarly, if somehow you give lands an ability after your Sun starts shining, they’ll keep it. Layers are a fun and intuitive part of the rules. Sun also doesn’t affect anything in your hand or graveyard because those are land cards. In Magic, a thing is only just that thing on the stack or the battlefield; everywhere else it’s a thing card. I figured there had to be a way to abuse this loophole. When I think of removing drawbacks from lands, I immediately think of the Karoo lands. 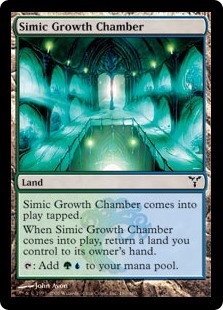 Simic Growth Chamber and friends have two lines of drawback text before their Sol-land mana ability. That is potentially a huge advantage (ignoring the fact that it can’t happen right away). There is one problem, however. Consider this iteration of Amulet Titan. While no longer scarily explosive without Summer Bloom, Amulet Titan is a viable deck. It is also still incredibly hard to pilot. I knew several pilots during PPTQ season who burned out playing Amulet Titan; not because they struggled to win, but because of mental exhaustion. Sequencing land drops is make-or-break for the deck. While miss-sequencing land drops often impacts decks, you can lose on turn two with an Amulet deck by playing or bouncing the wrong land. I can’t find the thread, but I remember after PT Fate Reforged someone figured out that if Justin Cohen had taken a different, 30+ step line, he could have won the finals. Small wonder those players I know finished the season on far easier Bant Company decks. In exchange for that complexity, you get an incredibly potent combo engine. Even with Bloom banned, Amulet can win on turn three with the right draw and correct sequencing. It’s just less likely, and the old turn two kill isn’t plausible. However, the aforementioned pilots told me that you can’t rely 100% on that combo kill, particularly after sideboarding. There are too many answers for the enablers and Primeval Titan. Instead, the deck adopts a Summoner’s Pact value plan. This works because of Karoo lands bouncing Tolaria West to find your Pacts, so you never have to hold them, smoothing your mana development. This is a much slower plan but makes it possible to overpower highly disruptive decks you can’t combo out. The idea got me thinking that if the combo isn’t really reliable and you want to be a ramp deck most of the time anyway, just embrace it. Following that logic, Blood Sun fits right into the deck. You lose some long-game value because you can’t bounce Tolaria under Sun, but that can be made up for with additional midrange creatures. To make this deck work, I replaced the combo pieces with the sideboard green creatures. Sakura-Tribe Scout is fine as an enabler, but is really bad if you aren’t just winning right away. If you can win off Azuza and/or Scout beatdown, you weren’t losing in the first place. To make Blood Sun castable, I added more red sources and took out the combo lands. In this deck, Hall of the Bandit Lord is better than Slayer’s Stronghold, because it grants haste via mana ability (which Sun doesn’t stop). Also, the sequencing with Boros Garrison required to make Slayer’s Stronghold and Sunhome work really complicates things. If nothing else, this deck is “easier” enough than Amulet Titan that even I can play it reasonably. Sun often acts like an additional pair of Amulets but costs three. This limits its maindeck value, but after siding you will want more, so I went with a 2/2 split. Blood Amulet has a slower goldfish than Titan, but in exchange, the deck is easier to pilot and has a better midrange plan. I can’t say it is a better deck, but I can’t pilot normal Amulet like I can Blood Amulet. In my book, that makes it far better. The question is whether this strategy is worthwhile. The combo, when you pull it off, is very fast; Amulet Sun definitely isn’t. Speed made the combo matchup plausible. Ramp decks tend to be quite bad against combo because they lack disruption and tend to be slower than Storm or Ad Nauseam. This version doesn’t have that advantage and the combo matchup is incredibly bad. The advantage, besides ease of play, is that you are far better against midrange decks. You’re starting game one with most of the anti-midrange package in and you have disruption in Blood Sun. Considering that both Jace and Bloodbraid are now free and belong in midrange decks, it is highly likely that midrange will be your primary matchup. It is hard to say how aggro matchups will change. The extra Walking Ballista is huge, as is Thragtusk, but you are also slower. This makes it easier to be swarmed. Then again, the rise of additional control decks may push agro out entirely. This version of Amulet isn’t obviously better than the mainstream version, but it may prove better in the metagame. Blood Sun may only see play as a sideboard card right now, but I’m certain that’s not its only use. There’s combo potential, and while I have time before GP Phoenix, I will be looking into possibilities. Join me next week as I dig into my testing results with Jace. Oh dear, am I turning into a polite euphemism? Doesnt blood sun non-bo with amulet of vigor? It’s not a non-bo technically, but they accomplish the same thing so under a Sun Amulet does nothing. Small nitpick, Amulet can still win turn 2 with a god hand: 2 Amulets, Azusa + Titan (either or both can be replaced with a Summoner’s Pact), a land the enters untapped, and a bounce. That’s so cool that Cohen could’ve won the PT with optimal play! I love the fact that the deck is so hard, that’s actually one of my favorite parts about it. I get bored of simple decks. If you could find the thread about Cohen’s line of play I would really appreciate it! As I said, it’s a bit implausible. Not impossible, but not really likely. I think it was more a case that the particular line was so convoluted and non-obvious that Cohen, even if he’d seen it, would never have been able to work it out while sitting at the table. As I remember the original poster said he’d spent quite a bit of time working through the turn in question and eventually found the line, but the fog of time makes it hard to say. It’s been three years and I just can’t find it, I’m not even sure where it was located. I did see some references to that thread but not a link, sorry. I was looking into some blood sun fun times. There was a blue moon type deck I am messing around with with blood sun and spreading seas instead of moon. Let’s you have a similar amount of lockdown but way more cantripping. For raw speed I am running simian spirit guides. Spreading seas into bbe turn 3 into sun is alot of power and the deck just goes through so many cards. Then just a bunch of burn spells and a few izzet charms. Ironically, Amulet Titan can kill/”go off” on turn 2 with the help of another Rivals card: Enter the Unknown. I’ve been playing around with a list that runs some extra Khalni Gardens to ensure I have targets. I’m not nearly well versed with the deck enough to be the one to break the card, but it certainly feels like something is there. I can see how that would work, though it does have the Polymorph problem of needing a target to work. On the other hand, maybe the answer for Amulet decks is to just go hog wild on being glass cannon decks.